Comet Electronics LLC, the leading provider of Automatic Equipment Identification (AEI) equipment, is now producing the RailNet AEI Reader System. With an install base of over 4,000 AEI sites, RailNet AEI Reader Systems are the de facto standard for Class I and regional railroad AEI applications throughout North America. 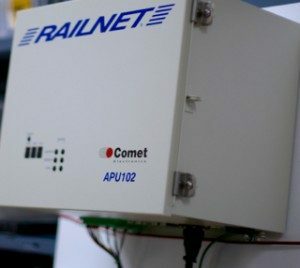 Comet’s RailNet AEI Reader System is designed to comply with the AAR Standard (S-9203, S-9203A, S-9203B and RP-9203) for Automatic Equipment Identification (AEI) and is available in single or double track configurations and is capable of handling trains operating at full track speeds. The standard equipment configuration includes a 4’ x 6’ hut with standby power and lightning protection. The standard system can handle up to four separate host sessions. This means that the system can transmit AEI “clean consist” data in up to four different formats to four separate host locations. This feature allows railroads to share AEI data where necessary and still receive data in their standard format. In addition, the system supports a maintenance reporting session for each consist reporting session. The RailNet AEI Reader Systems uses AEI to identify rail equipment by reading electronically coded radio frequency (RF) identification tags mounted to locomotives, railcars, trailers, end-of-train units(EOT) and intermodal containers. AEI Reader systems provide automated tracking of railcars and shipments via RF tags, and make shipment location information available to railroads and their customers. Please contact Comet Electronics LLC to discuss RailNet AEI Reader system solutions. Turnkey solutions are also available. Comet Electronics is dedicated to staying current with technology. With the advancement of technology we pass on the convenience to our customers by keeping an eye out for updates to any antiquated systems. An example of this effort can be seen in our offering of cellular wireless site communication which offers the stability of communication where POTS lines would be an inconvenience from a monetary standpoint as well as implementation. Our team of in-house developers work to bring more value for the hardware you already own. By building hardware with components that can utilize potential software capabilities in the future we can provide new functionality without the requirement to buy new hardware. The Railert Automatic Tag Reader(ATR) System bridges the gap between a hand-held data recorder and the traditional full featured AEI system. Collecting tag data with a hand-held reader is overhead intensive. Until now! The Railert ATR is designed to offer a simplified, lower cost option over previous offerings. Railert ATR is a single-antenna unit with modular components mounted inside a NEMA 4 box. The modular design makes installation and repairs fast and easy. The NEMA 4 box also eliminates the need for expensive shelters. Each unit is fully assembled and tested directly in house prior to shipment. As an additional cost savings benefit, the Railert ATR is now configured to be installed by you! Contact us for details and pricing. The system accurately capture data at infrequent intervals regardless of weather, from radio frequency (RF) tags mounted on locomotives traveling up to 30mph. Reports are generated instantly and delivery via email. Easy to buy, simple to operate with minimal maintenance are just a few of the benefits of purchasing the system. The system is provided to you from one of the most trusted names in rail communication; Comet Electronics. Note: The Railert ATR does not report the presence of non-tagged cars and therefore it is not meant for use where an AAR S-918 compliant AEI system is required. Can’t afford to wait to send your equipment in for repair? You are in luck! Comet offers maintenance programs with yearly contracts that will keep your site running year round. In the event of unforeseen outages, out of band site maintenance is also offered. Comet’s AEI System Maintenance program is designed to provide regularly scheduled maintenance, proactive remote monitoring and repair services. This includes the necessary technical support to ensure proper operation of critical reporting equipment. In addition to providing scheduled maintenance, monitoring and as-needed repairs, customers who elect to use Comet’s AEI System Support program, receive expedited handling of field equipment repairs and elevated priority when equipment is returned for repair. This includes substantial discounts for service calls and repairs not associated or included in the Maintenance Support Program. Largest installed base of systems with approximately 4,000 AEI Reader sites currently in service. If you don’t need the full features of an AEI system but still need to read tags, there is an alternative offered in the Railert ATR System also available from Comet. The system is low cost and designed to be installed by you.